Turkey has 7,200 kilometers of coastline so whether you’re looking for a peaceful, private chunk of sandy beach to relax or a party scene with bumping music and exotic cocktails, you’re bound to find both and everything in-between in Turkey. Rent a car and take the coastal route, stopping along the way to enjoy the views of the sea or relax on one of the many undeveloped beaches along the way. 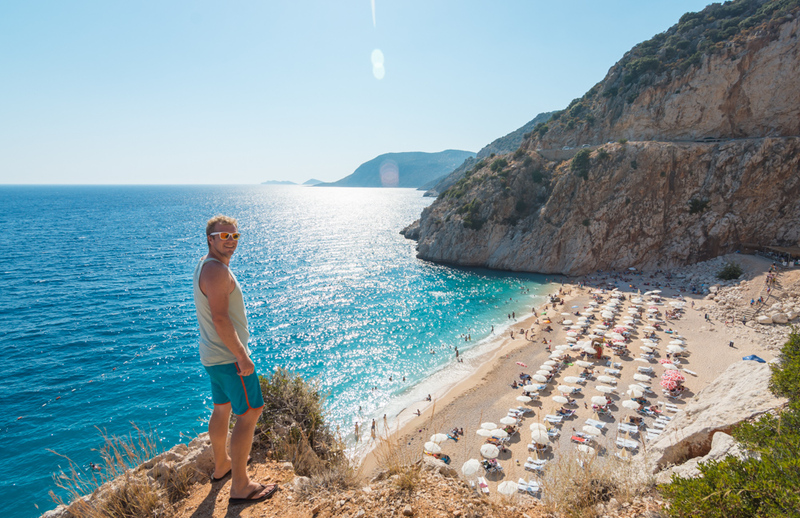 We’re sharing a few of our favorite spots along the southern riviera so you can enjoy the best of the best beaches during your trip to Turkey! If you begin your Turkish holiday inland where the land can be extremely dry, you’ll find the beautiful bustling port city of Antalya to be a pleasant surprise. The old town is a quaint, cobblestone pedestrian area right on the sea that comes alive around 9:00pm with tourists and locals alike. Full of hotels, shops, restaurants, and bars, it is the hip-happening place to be in the evenings as the heat of the day finds most people lounging by their hotel pool or hanging out at one of the many beaches nearby. If you’re not in the mood for a beach day, head to the pier and jump on one of the many tour boats that depart throughout the day! Right outside of the old city is a main street that is nearly empty until after sunset when loads of ice cream shops, bakeries, candy shops, and market stalls selling local wares open their doors. It’s the best time to order a Turkish tea at an outdoor restaurant for prime evening people watching. The restaurants in the old city are a bit overpriced but you can find a few gems like Can Can Restaurant just a few blocks away. You’ll want a few days in Antalya so don’t rush your stay! The reason that the streets of Antalya are like a ghost town during the day is that everyone has taken the 20-minute bus ride to Lara Beach. This local hot spot is packed – both on the beach and on the grassy area behind the beach – with Turkish families hosting BBQs, kids splashing in the water, and everyone else reclining on lounge chairs drinking ice cold beers. The beach is sandy and the water is the perfect temperature for going for a long swim. And it is a great place to be entertained by the hilarious activities going on around you. The best beaches of the area, however, are on the long stretch of coastline between Antalya and Kaş. It’s a 4-hour drive so rent a car so that you have the freedom to stop and enjoy the sights as often as you please. If you’re looking for a truly secluded beach on Turkey’s southern riviera, continue west and you’ll happen upon a backpackers haven where you can even rent treehouse-style bungalows. The quaint towns of Çıralı and the neighboring Olympos are most certainly tourist destinations but offer a quieter, more relaxing experience than Kemer. True there are plenty of restaurants and shops in both towns but you won’t find lounge chairs covering every square inch of sand. Whether you want to relax on the beach or explore ancient ruins, you’ll find plenty of things to keep you busy in the area. Kaş is a small, incredibly quaint town about 4 hours west of Antalya. During the day you might not think it to be a very notable place to visit but just wait. Watch sunset from the amphitheater and then head to one of the many restaurants, grab a front table for dinner and watch as the hordes of tourists descend to enjoy the late night shopping and the many delicious ice cream and dessert stands. Hanging out in the main square is a great time but the real surprise of the town is found in exploring the back alleyways that seem to jut out in every direction. Every turn finds new shops, hookah bars, restaurants with live music, rooftop patios, and stalls hawking locally made jewelry. With so much to see and do, it’s difficult to decide where to stop for a glass of wine or Turkish tea. When you initially round the bend of the amazing road that winds along the edge of the sea to the parking area for Kaputaş Plaji, it will likely cause you to be a bit overwhelmed initially. But once you navigate the traffic and the tight spaces between the haphazardly parked cars and catch a glance of the stunning beach below, you’ll know it’s all worth it. Descend the staircase to the small, sandy beach surrounded by cliff walls and purchase a beach chair and umbrella for 5 lira each. 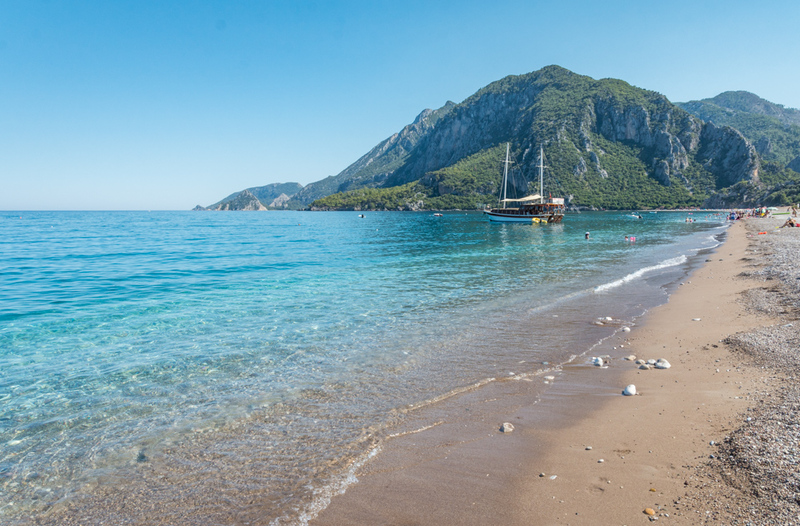 Kaputaş Plaji is absolutely picture-perfect and one of the best beaches in Turkey! If you continue another 20 kilometers past Kaputaş you’ll find Patara Plaji. Before you arrive to the beautiful 19-kilometer long sandy beach, you’ll drive through stunning ancient ruins. You can purchase a pass to explore the entire area or just to visit beach depending on your preference. Once you arrive at the beach, take advantage of the convenient amenities offered or wander down past the lounge chairs to find a bit of privacy. Whatever choice you choose, you’ll find soft sand and clear, calm water – perfect for an afternoon of relaxing. If you get tired of lounging on beaches and are craving another type of adventure, head to Xanthos to explore the UNESCO World Heritage site of ancient ruins. The necropolis and amphitheater are the highlights of the area and are only a short walk from the road so you don’t have to go far to explore the well-preserved ruins. Selçuk is a very small town and is the place to stay when visiting the popular ancient ruins of Ephesus. Most people visit Ephesus with a tour group – either from a nearby city or from a cruise ship that has docked at the port. 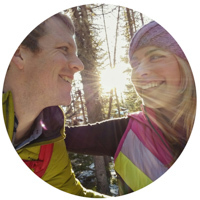 So you’ll find mostly locals there – men sitting at little outdoor restaurants playing games and drinking tea when the sun goes down, kids riding their bikes, and families enjoying an evening stroll. If you have the time, it’s a great town to spend a few days lounging by the pool, shopping for plush Turkish rugs, and mingling with the locals in the pedestrian streets of the city center. Stay at Ayasoluk Hotel which is run by a darling couple; she is from Colorado and he is from Eastern Turkey and they will make you feel right at home. The hotel itself is stunning; modern rooms with ultra-soft beds and touches of Turkish charm in the large oriental rugs and beautiful handmade comforters. The garden is the perfect place to relax with shady seating areas and an inviting pool offering views of the city. Ayasoluk offers an impressive breakfast spread every morning so be sure to start each day enjoying freshly baked pastries, mouth-watering traditional egg dishes, fresh fruit and veggies, and a wide variety of jams, cheeses, olives, nuts and dried fruits. They also offer a wonderful selection of Turkish rugs in the basement of the hotel, a bar, and a restaurant serving savory traditional Turkish dishes. If you were so inclined you could spend an entire day at the hotel – they have everything you could ever want! Just about an hour outside of Selçuk is a gorgeous national park situated right on the coast with beautiful beaches surrounded by forest land. There are 5 main beaches to choose from; some sandy and some with smooth pebbles. All of the beaches offer delicious restaurants, amenities including lounge chairs and umbrellas, crystal clear water, and lots of wildlife for viewing including wild pigs that might even come up to you for a sniff. It’s the perfect day trip when visiting the area. 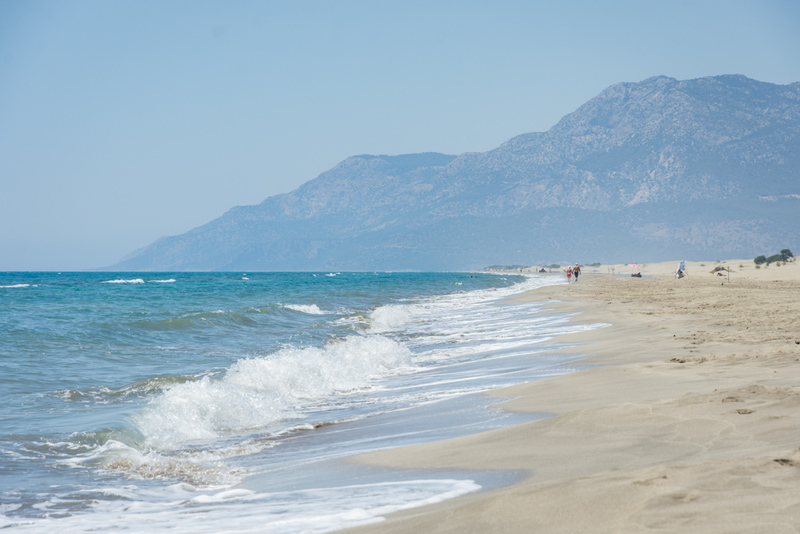 A short 15 minute drive from Selçuk is a beach that is a popular day trip for Turkish families. It’s a long sandy beach with shallow water perfect for kids to splash around. There are also plenty of amenities. 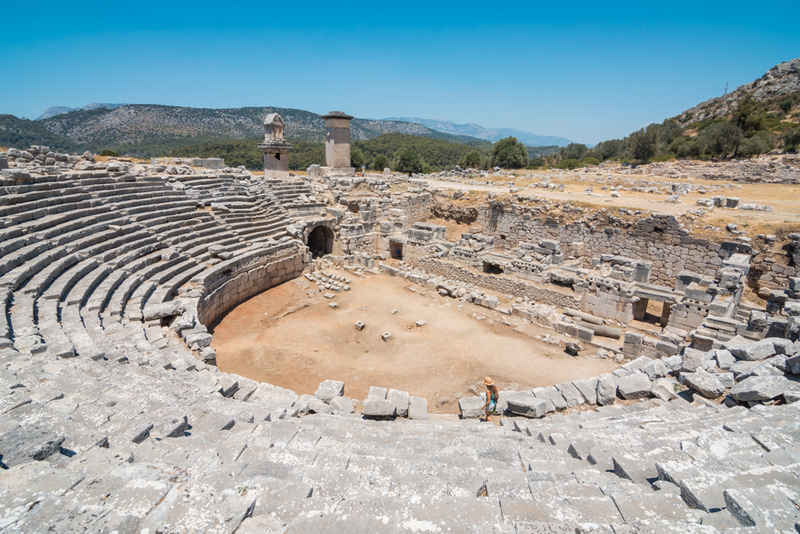 Most tourists visit Selçuk to tour the ancient Ephesus ruins that sit just 3 kilometers from the city center. The ruins are rich in history; first becoming a Roman city in 133 BC and then the capital of Asia Minor in 27 BC when it grew to a population of 250,000 people as it was a busy port town. In its peak in the first and second century AD it was estimated that 400,000 people called it home. 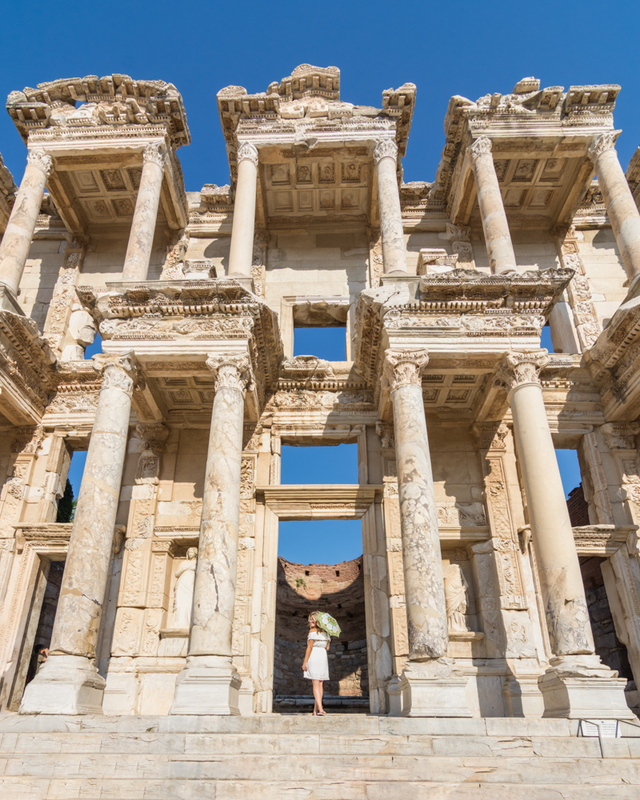 The infamous Library of Celsus, the third largest library in the ancient world, was constructed at Ephesus in 123 AD and has been expertly preserved and reconstructed to be the highlight of the ruins that it is today. The area opens for visitors at 8:00am and tour buses take advantage of arriving before the heat of the day. If you want to avoid the crowds, consider waiting to visit until the later afternoon when all of the buses have headed home for the day. What are you waiting for! Start planning your trip to Turkey! Want more info on what to do in Turkey? Check out our favorite books!